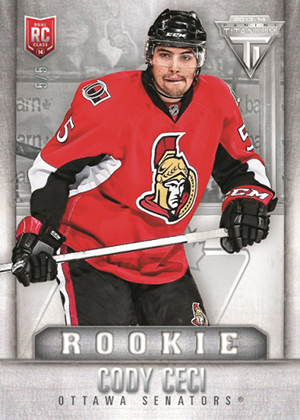 If variety and first-year players are your thing, 2013-14 Panini Rookie Anthology Hockey has them both. Featuring a mash-up of updated content from past sets as well as new content, the product delivers four hits per box including at least two autographs. 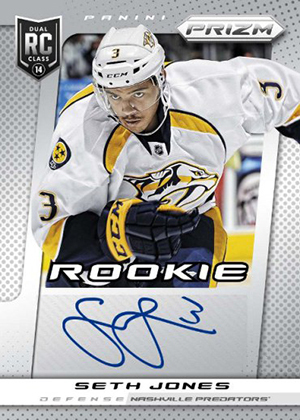 When 2013-14 Panini Prizm Hockey came out, it was too early to make it a product that fully embraced the double-rookie class. While it had all the key players to debut last year, it was missing Nathan MacKinnon and the other 2013-14 rookies. Rookie Anthology fills in many of the gaps, not only with rookies but players in updated uniforms. New Prizm Autographs are also included. From 2013-14 Panini Dominion, Rookie Autograph Patches, Peerless Patches and Rookie Ensigns are all getting additions. Other sets with updates include 2013-14 Panini Crown Royale Rookie Silhouettes and more than 50 2013-14 Panini Titanium rookie cards, which are numbered to the player's jersey number. 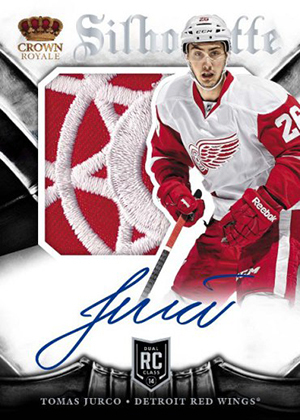 New content in 2013-14 Panini Rookie Anthology Hockey is highlighted by Rookie Selection Dual Jersey Autographs. Numbered to 249, every box has one. Parallels include one-of-one Dual Tag versions. 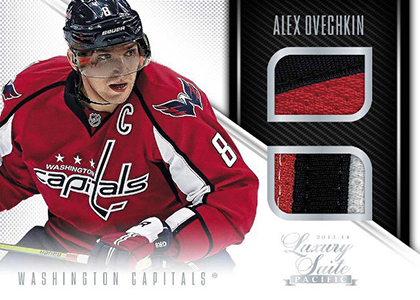 The Luxury Suite name returns with Luxury Suite Single- and Dual-Memorabilia cards as well as Rookie Autographs (#/99). Short Prints are noted below. SP = 75-100 cards, SSP = 50 or less. 50 cards, are base cards from other sets? And how much will a box cost? Nick � In the past it has been a mix of a specific Rookie Anthology set with updates from others. I haven’t seen a price point just yet, but probably similar to past years. First off, let me say that I am a HUGE fan of the Rookie Anthology brand/lineage. This year they replaced the box topper with an extra hit on average in each box. A few of the boxes had six hits while the rest had five. There was a good mix across all brands in this product (Luxury Suite, Select, Prizm, Score, Titanium and Dominion) and we enjoyed every box that we opened. The only down side to this product is the thing that continuously plagues ALL of Panini releases since the release of 2010-11 Certified…HORRIBLE COLLATION. Out of one case I wasn’t even able to put together a base set of of 100 cards (8 short). Some cards maxed out at 9 copies. Insert cards were a bit better on the collation front. Out of the 4 Prizm rookie autographs in this case, we one was a duplicate. 49 cards in the Prizm autograph set and a duplicate was pulled. Besides the typical issues with collation this was a fun break. I bought two boxes on the day of release, very, very excited. I got 5 hits in both, which is really nice! My first box was one of the worst boxes I have ever gotten in my collecting history. Pack One: Reto Berra (GROSS) Jersey Auto /99. THE VERY NEXT PACK: Reto Berra Prizm rookie auto. Now, I’m an Avalanche fan, and unless there’s a miracle, Berra is the worst goalie that has ever put on an Avalanche uniform. THE NEXT PACK: Calvin De Haan (?) Score (blechh) signatures. 3/10 packs, 3 bad “hits”. Terrible. NEXT PACK: Calvin Pickard (another No name Avs Goalie) Rookie selection jersey auto /199. Then 5 packs of nothing. Last Pack: Johan Gustafsson (?) Score (terrible) Hot Rookie signatures. Now, I did get 5 hits, but that left a terrible taste in my mouth. Awful. The next box can’t be THAT bad, right? First Pack: John Vanbiesbrouck Luxury Suite Stick /199. Awesome card. Couple packs later, Dominion Auto Rookie (only 1 clr) Patch Auto Max Reinhart /299. Beautiful, on card auto, nice. Ryan Murray Titanium Rookie Gear (4 clr) Patch /25. Beautiful. Select Rookie Auto Jersey Michael Raffl /199. Nice. Lastly, Stefan Matteau Rookie Selection auto jersey /199. Not bad. Overall, I like it. If I had just gotten the second box, I’d give it 4-5/5. But, due to the first, awful box, I give it a 3. I cracked a case and was very pleased with Athology this year. I got four autos in every box. Two more than what the box guarantees. Most autos are sticker with one on card auto but for the price of the box, I really can’t complain. Also got some relic stick pieces which are very cool. Overall great product. I love the idea of this product but wish it was upper deck instead (not a panini fan). While buying a box of series 2 hockey and 2 jumbo bowman boxes I decided to try 1 pack of this anthology and my $11 gamble paid off big, I pulled a single color peerless patches auto 27/50 of big mack!